The Pacific Institute has released the first comprehensive assessment of California’s water footprint, providing an important perspective on the interconnections between everyday activities and impacts to water resources – both at home and around the world. The new report, California’s Water Footprint, analyzes the state’s water footprint – that is the amount of water required to produce the food we eat, the clothes we wear, the beverages we drink, and the other goods on which we rely. The water footprint of the average Californian is 1,500 gallons per day, slightly less than the average American but considerably more than the average resident in other developed countries or in the rest of the world. 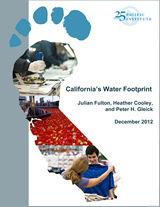 The 2014 report, Water Footprint Outcomes and Policy Relevance Change with Scale Considered: Evidence from California, sheds new light on sustainable use and, in California, is being considered with a suite of sustainability indicators for long-term state water planning. Key to this integration has been grounding the method in local data and highlighting the unique characteristics of California’s water footprint, presented here. California’s total water footprint is an estimated 64 million acre-feet of water. That’s more than double the amount of water that flows down both of the state’s two largest rivers, the Sacramento and San Joaquin, in an average year. An estimated 38 million acre-feet of water is used to produce goods and services within California. Half of that water is used for goods that are then exported and consumed outside the state. The remainder – about 19 million acre-feet of water – is used to produce goods that are consumed in California. An additional 44 million acre-feet of water is required to produce the goods and services that are imported into California and consumed here, making California a net importer of virtual water. More than 90% of California’s water footprint is associated with agricultural products: meat and dairy products have especially large water footprints due to the water-intensive feed required to raise the animals. An additional 4% of the state’s water footprint is associated with direct household water consumption (primarily for watering lawns and gardens), and the remaining 3% with other industrial products we consume, such as clothing and electronics.